Halifax’s former Batley full back Miles Greenwood insisted he was confident his side could take the win at Mount Pleasant, even when they led just 6-2 at half time. A Matt Place try just before the break, converted by Steve Tyrer, gave Fax a lead to defend up the old ground’s infamous slope, with Richard Marshall’s side coming out on top after a rock-solid defensive effort. “I did enjoy it, very much, and I thought we deserved it,” said Greenwood, who spent two seasons with John Kear’s side before leaving to rejoin Fax last autumn. “Sometimes, you can have all your tip sheets and game plans and tactics, but it just comes down to sheer determination and enthusiasm. “Everyone showed they were willing to work for the person beside you. “They all stood up when it mattered and that’s really pleasing for us. “I was confident; we had a good chat at half time, and although it was always going to be tough against a motivated, well coached side, I knew we could do it. “Batley won’t be held scoreless going down the hill too often this year. 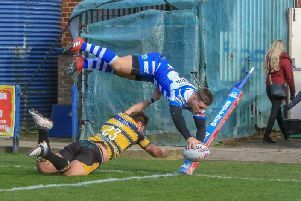 Fax host Featherstone on Sunday (3.0), a key fixture as the competition’s part time teams scrap for places in the so-called ‘middle eight’ with Super League’s bottom four. “We have a lot of hard work in front of us this week,” said Greenwood. “It’s a hard competition, we’ve done a job at Batley, we’ve got another to do next week.